I woke up on September 17th with four and a half hours of sleep, left for Newark Airport at 9am, took off for Phoenix at 11:50am, met two friends at the airport at 2pm (after gaining three hours by changing time zones), got a ride to the Super 8 Motel, dropped off my stuff, and made the 15-minute walk to Chase Field. bring me to the Home Run Derby and All-Star Game. Kevin, who’s attended over 130 major league games this season, is the guy wearing the orange shirt in my 8/14/06 at PETCO Park entry. 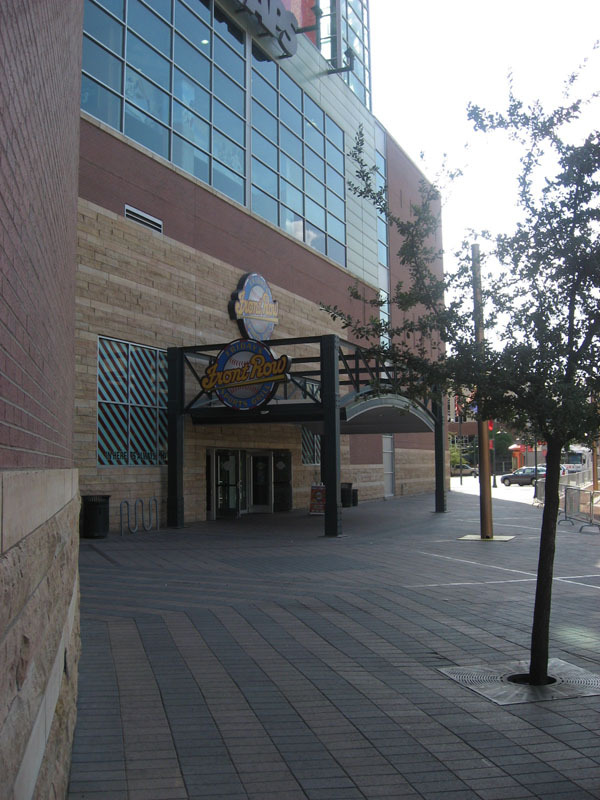 Both he and Brad were familiar with Chase Field, and they shared the greatest ball-snagging secret of all: There’s a restaurant built into the ballpark called Friday’s Front Row Sports Grill. You enter on the outside, and you can walk right through it and exit out the back onto a terrace inside the stadium in the second deck in deep left field. I’d like to think that if I were there by myself, I would’ve discovered this trick on my own, but I’m glad I didn’t have to. mean, I literally couldn’t believe it. There weren’t any other fans there. We had the whole stadium to ourselves, and really, I had the whole stadium to MYself. That’s because Brad decided not to go for balls until the gates opened, and Kevin was only interested in catching home runs. This meant I was the ONLY fan asking for balls. A pitcher on the Diamondbacks threw me my first ball. I have no idea who it was, and it doesn’t matter. I was just psyched to get one so early in the day. There’ve been a few other times when I snagged a ball before the stadium opened (Friday’s in Miller Park, Waveland Avenue outside Wrigley Field, the portwalk outside AT&T Park) and it’s a great feeling…getting on line at the gate and already having a ball. Or three. out, it didn’t make much of a difference. Unlike Shea and Yankee Stadium, where there are hundreds of people waiting to get inside for BP, there were only SIX fans waiting on line as late as 4:20pm. way down to the front. I didn’t plan on staying in the gap section (which is officially known as Section 105-W), but I wanted to check it out briefly. Brad introduced me to the friendly usher, and when she saw coach Kirk Gibson ignore my polite request for a ball, she reached into a cup holder and pulled one out that had landed in the gap a few minutes earlier, and she handed it to me. And there it was: Ball No. 3,200. Not too exciting, but it counts. I never counted the few balls that were given to me by other fans, but I decided long ago that balls from stadium employees would count. Why? Because security guards at Shea and Yankee Stadium used to (and still occasionally) go out of their way to prevent me from getting balls. 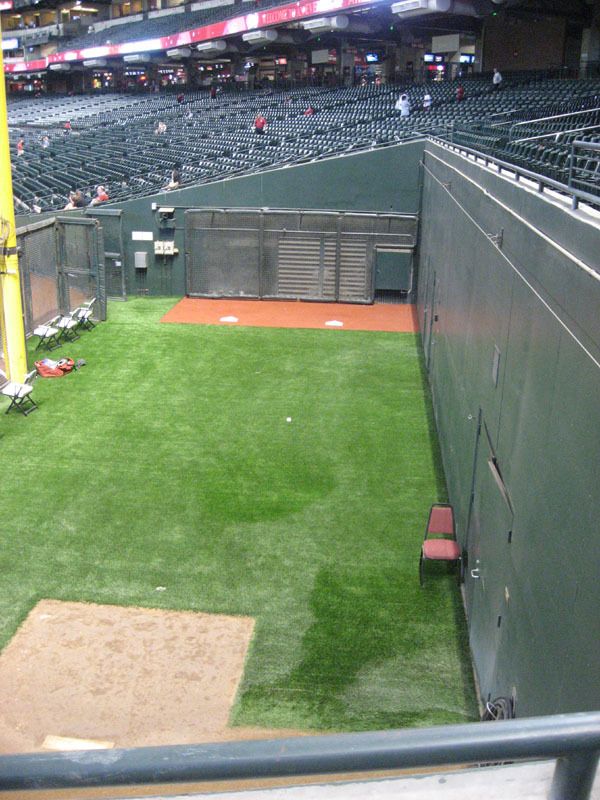 At Shea, the on-field guard down the left field line used to run over and kick ground balls away during BP as I was leaning over the wall to scoop them up, and at Yankee Stadium…don’t even get me started. The worst offense took place in the early 90s when I got Royals pitcher Hipolito Pichardo to throw me a ball along the left field foul line. The on-field guard darted to his left and reached out with his bare hand and slapped the ball out of the air and deflected it to another fan as I was reaching out to catch it. And let’s not forget all the times I’ve been stopped from using the glove trick. 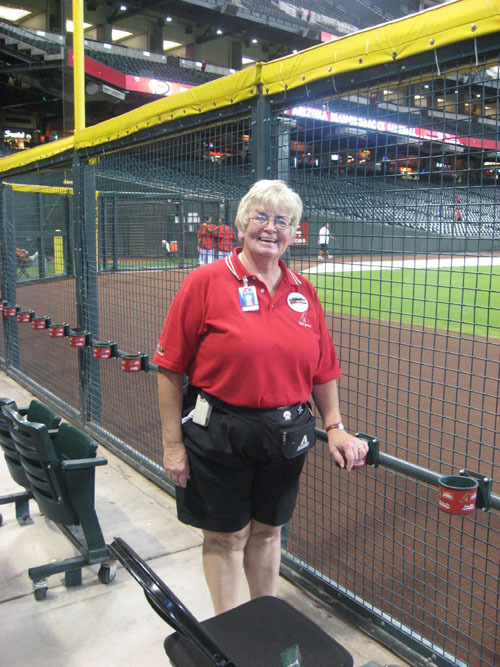 Security guards have probably cost me 300 balls over the years, so at this point, if I’m on the road and a stadium employee doesn’t know me and feels like handing me a ball…yeah, you bet it counts. The usher’s name, by the way, is Annie Schock. I had to get her name, not just for ball-snagging documentation purposes, but because I wanted to let management know how great she was. 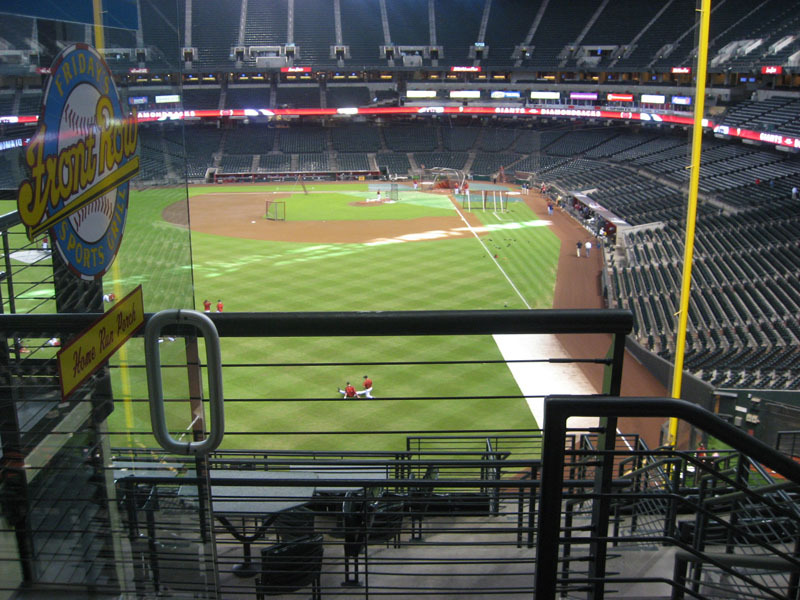 I sprinted from right field to left field (which only took a minute thanks to the concourse that runs behind the batter’s eye) and was surprised when the Diamondbacks’ portion of BP ended at around 4:40pm. The home team always takes BP first, and usually they wrap up about 90 minutes before game time. Luckily, the D’backs occupy the 3rd base side so I was able to race through the seats and make it to their dugout just as the last few guys were coming off the field. That’s when I got my fifth ball of the day from a guy who looked like he was the team’s strength and conditioning coach, and if that’s who it was, then his name was Nate Shaw. The Giants took the field, so I switched into my orange and black “SF” cap and got my sixth ball of the day from pitcher Noah Lowry along the left field foul line. 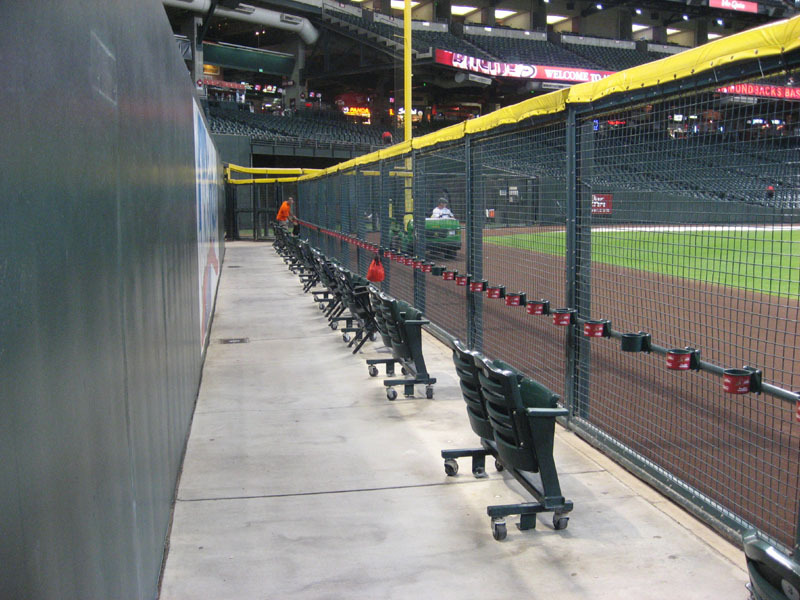 I’d heard that security at Chase Field is strict and that they don’t like people using ball-retrieving devices. That’s how it was when I was there for two games in 1998, but this was a new decade, and when I saw a ball sitting in the left field bullpen, I had to go for it. The ball was about eight feet out from a 15-foot wall, so I had to let out quite a bit of string and then fling the glove out and tug the string at just the right moment in order to knock the ball closer. I nailed it on the first try, then quickly pulled up the glove and set up the magic marker and re-lowered it for the easy snag. Moments later, a security supervisor walked down the steps and stood behind the bullpen and visually stalked me as I disappeared into the left field bleachers. a few dozen rows, but they’re bad because of the cup holders that jut out and make the narrow rows even tighter, and because the benches have sharp corners. I discovered this the hard way when I lunged for a ball that Jack Taschner tossed my way and got a nasty little scrape in the process. (At least I got the ball.) 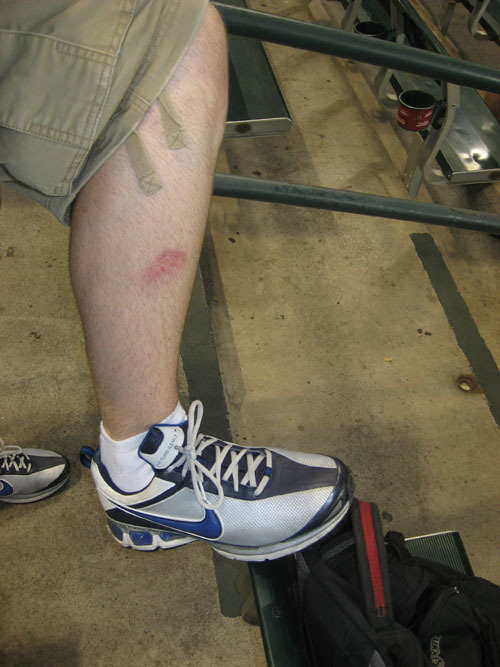 When I showed my battle wound to a Chase Field regular named Tony Dobson, he said, “Now you’re one of us.” He was wearing shorts and pointed out several fresh recent cuts and older scars. 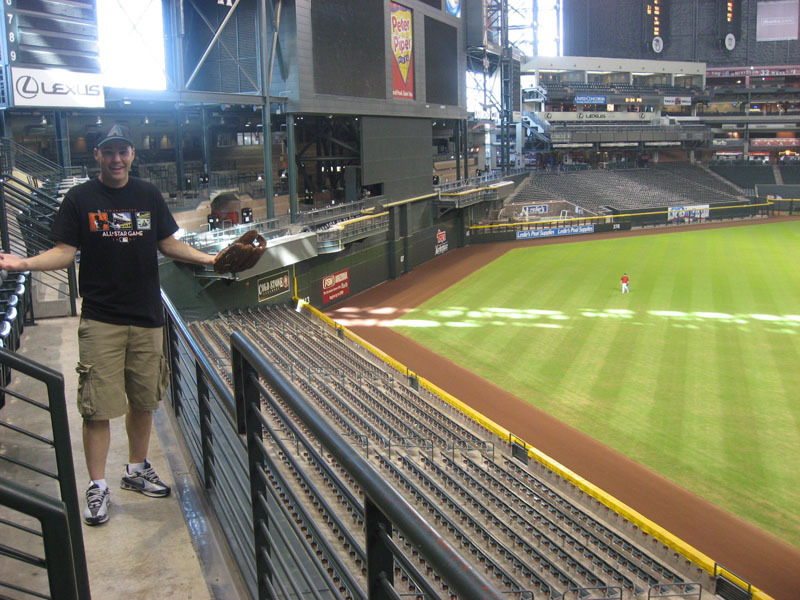 Thus, my advice for anyone going to Chase Field: Wear long pants. I don’t care if it’s 109 degrees. If you plan on running around for balls, your legs will need protection. 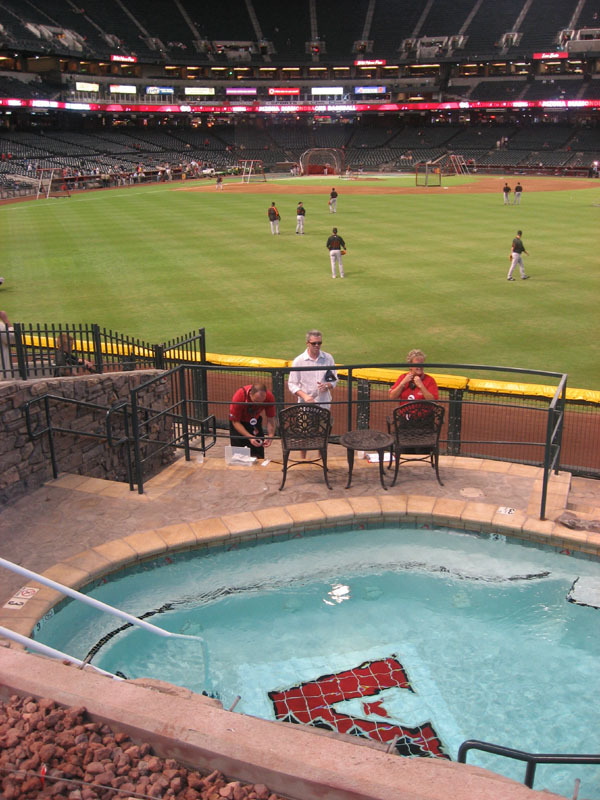 I avoided bodily harm while snagging my next two balls–numbers nine and ten–directly behind the swimming pool which, by the way, costs $6,000 per game for a group of 35. Scott Munter threw me the first and Daniel Ortmeier threw the second. I was pumped to have reached double digits, but disappointed that I hadn’t caught a single batted ball. coach Joe Lefebvre. Then I got Tim Lincecum and Scott McClain to sign my ticket stub. Then I got a hot dog and a small pepperoni pizza and once the game began, my evening of wandering was underway. I walked through the concourses and up to the upper deck. I couldn’t believe how much space there was. 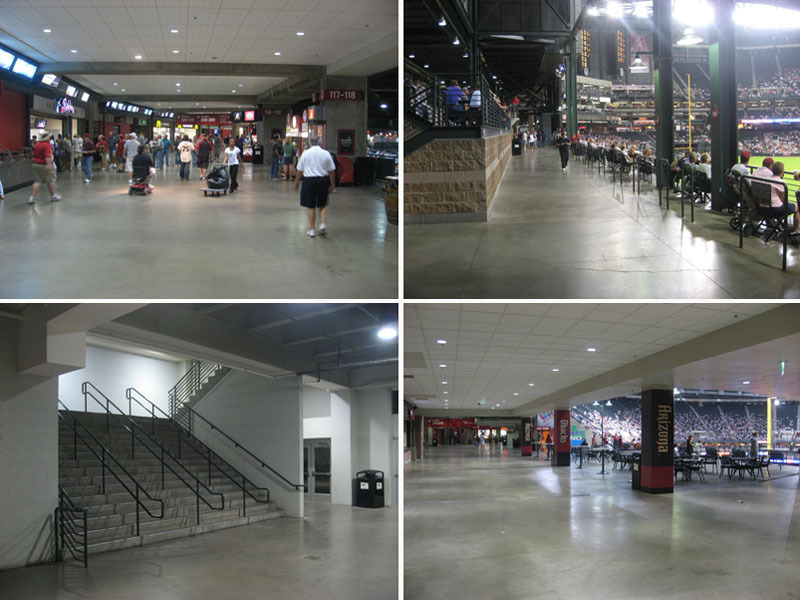 That’s the beauty of new ballparks, especially those that’re built on cheap land in the desert. …and there weren’t any security guards up there. It was ideal. No one harassed me or gave me weird looks as I explored the outer reaches of the stadium and went nuts with my camera. After a few innings, I went back down to the gap section in right field and checked in with Brad. The corner of the section closest to the foul pole provided a great view into the Giants’ bullpen. In the photo below, it might look like reliever Patrick Misch is trying to pull out the batting cage, but he was just stretching. usher checking tickets at the bottom of every staircase in the aisle. 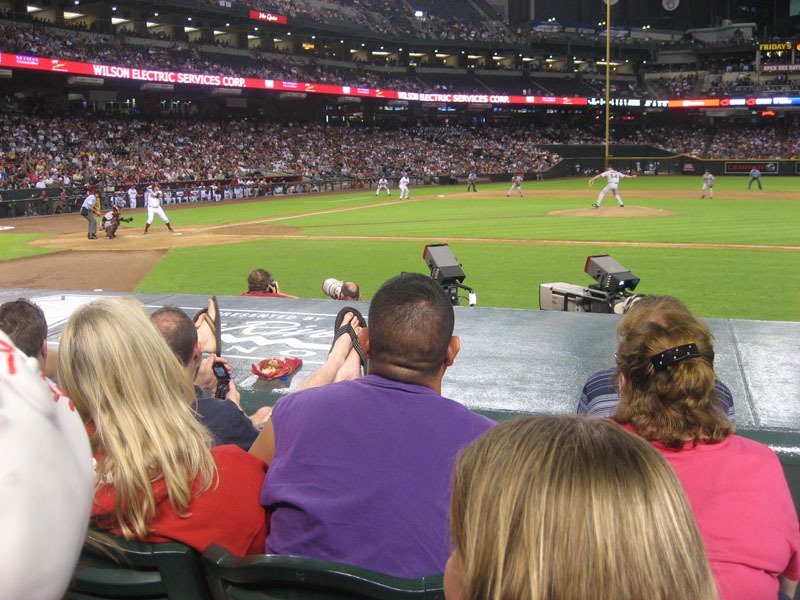 So, to get down to either dugout, you have to sneak past two ushers, and unlike most ballparks where the ushers stop checking tickets after a few innings, the folks in Phoenix continue checking tickets late in the game. What the hell?! How dare they try to keep me out of sections where I don’t belong?! Anyway, I didn’t get any third-out balls at the end of innings, but I did get the infield warmup ball from coach Willie Upshaw before the bottom of the 9th. And that was it. Twelve balls. Not terrible. Barry Bonds, who was one-third of the reason why I flew to Phoenix…well, he didn’t play because of a strained toe, and I didn’t care. I’ve already caught one of his home runs, so whatever. After the game, I collected a few dozen ticket stubs in the empty seats, and then my personal tour guides (a.k.a. Brad & Kevin) took me to the players’ parking lot where I got 11 autographs: Eric Byrnes, Alberto Callaspo, Tyler Walker, Bob Wickman, Eugenio Velez, Dan Giese, Rich Aurilia, Patrick Misch, Eliezer Alfonzo, Kevin Frandsen, and Jeff Salazar. Within one hour, I got more autographs than I’d collected all season. • 23 autographs in 33 games this season = 0.7 autographs per game. 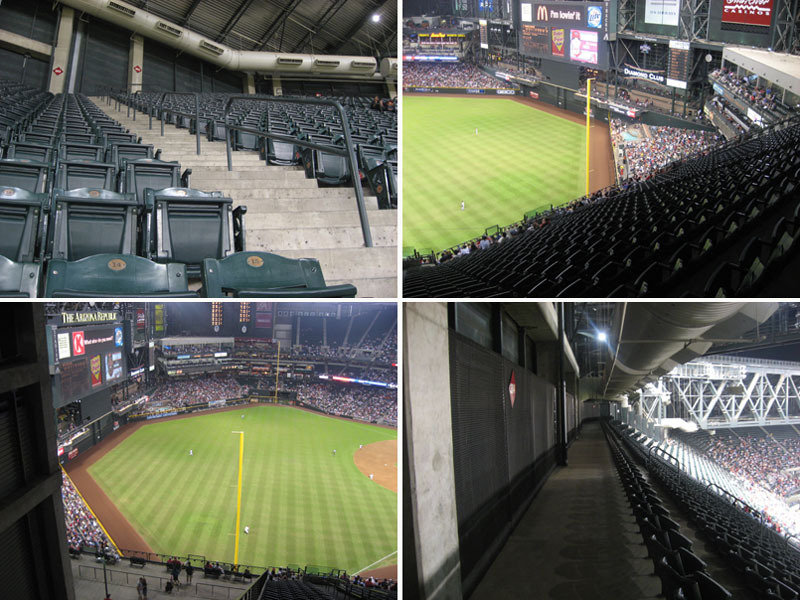 On my trip out west this year, Chase was the only NL West ball park I DIDN’T see.. In San Diego, I sat next to some surfer dudes, We had some interesting conversations. wait you were at that game? Cubs- If you get to Dodger Stadium 2hr before game time, they let you in the left feild, feild level seats with an upper deck ticket. I did not find out until after many games of snagging but it has really helped. Congrats on such a fruitful harvest of balls & sigs!!! I needed to hear some good news tonight! Zack- This trip is SO RANDOM. It’s awesome. Congrats on a great day, and thanks for the tip, im planning on going to Chase sometime next year. Looking forward to the next updates. I love hearing about out of town stadiums! Cubs- Im sorry, Dodger stadium *****. Luckily i know a lot of the ushers from being there way too much, so they let me down. I did enjoy the game though, I got first row of the upper deck, near first base. And I had panda express at a baseball game for the first time! My only regret is not bringing a personal radio to listen to Vin Scully. Another great game. Sounded like a great trip except for the part where you had to hang out with the Giants fans. Ha ha. What made you want to go to Phoenix all of a sudden? No BP today. Snuck down and sat in row 1 by the Padres dugout. Got Joe Thatcher to throw me a warm up ball and Adrian Gonzalez threw me the third out ball at the end of the top of the second inning. See folks, Zack’s snagging principles really do work. Even for old guys. After that I went back out to LF and tried for another game homer. Didn’t happen. Two days in a row would be too much to hope for. The two balls today made it 100 exactly for me this year with three home games to go and hopefully playoffs. There is also talk amongst my friends about a possible last minute trip to Milwaukee to see the Padres/Brewers next weekend. We’ll see. Hey, did you get the Giants fans to pay for your airline ticket or did you have to pay? Leigh, what did you do with Braun’s homer? Did the Brewers/Braun try to bargain for it? Congrats on ball 3,200 especially because you got it in an out of NYC stadium. I’m probably going to Chase in 2009.Oh by the way what are your snagging experiences at PNC park? How about a trip to LA next weekend. Could be the last 3 games of Barry’s career! Let me know if you get the “itch”! I can get some tickets! I’m leaving for Yankee in 15-20 min (I hope.) My dad said 3:15 was “crazy early” and that he wouldnt be ready, but 5 minutes before that he told me that he was ready when I am. I want to get my first foul ball today beacause I’ve seen balls land in the seats that I’m in. 5th row behind the Jays dugout. I want them to win to try to get balls after the game, but I want them to lose cuz I’m a yanks fan. If the Yanks and Boston lose, then I’m happy both ways. Go who ever’s playing Boston!! talk about a random trip! haha. anyway ill be at shea monday night. my dad knows some guy who has tix to those sweet front row padded blue seats so for once i can sit there during the game and bp and have no competition basically. when do you think youll be at shea next? Hey, it’s Bryan from the game. Nice job! You did awesome! 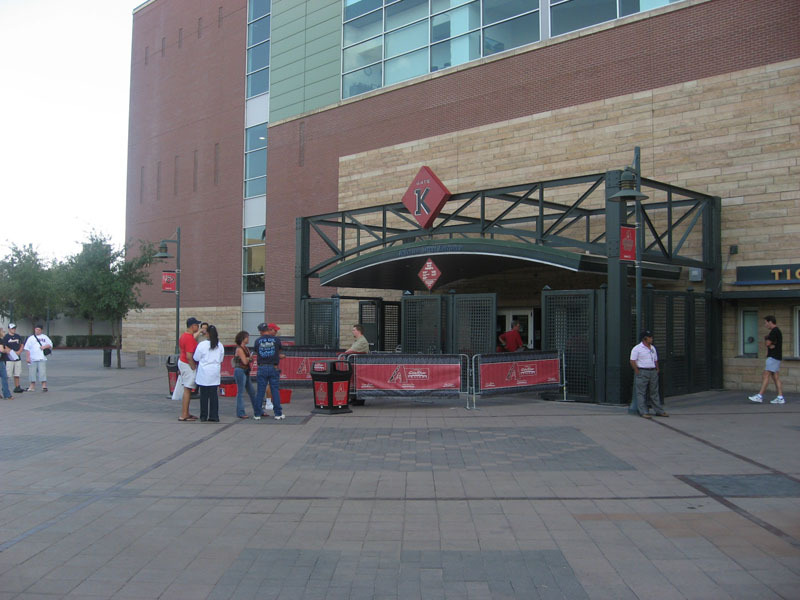 I really hate the tight security at Chase Field, too. I hate those stupid ushers! Do they always have to check your ticket? They’ve prevented me from getting a bunch of autographs. Let me know if you are in Arizona again! Hey dont be telling me my SOX are gunna lose puckcollecter! my boyfriend telling me that on a daily basis is enough……yes he is a yankees fan. THE SOX WILL WIN THE DIVISION!!!!!! To add to my earlier post, when I said Bryan from the game, I meant Wednesday’s game, not this one. Anyways, it was nice meeting you. I enjoy your blog a lot! Kaylee: I sorta want the Sox to win the division cuz if the Yanks win the Division, I can’t go to Opening Night for the Islanders. I arrived at the gates at 4:30 and was first in line. Security checked me before the gates opened, so I was able to run right in. I asked Joba for an autograph, but he didn’t respond. So I took up my spot in the aisle and waited. There must have been 20-30 Yankees and a trainer/translator for Matsui I think. I kept trying to ask him in Japanese, but I don’t know if I said it right (can we get a correct translation Zack.) After 5 minutes I was shut out, and my hopes were dying. But I got Ross Ohlendorf to throw me a ball, but it fell short into the gap, and security gave it to me. I love the September call-ups because if you know their name, you have such an advantage. I gave the ball away to a kid (and yes he had a glove.) 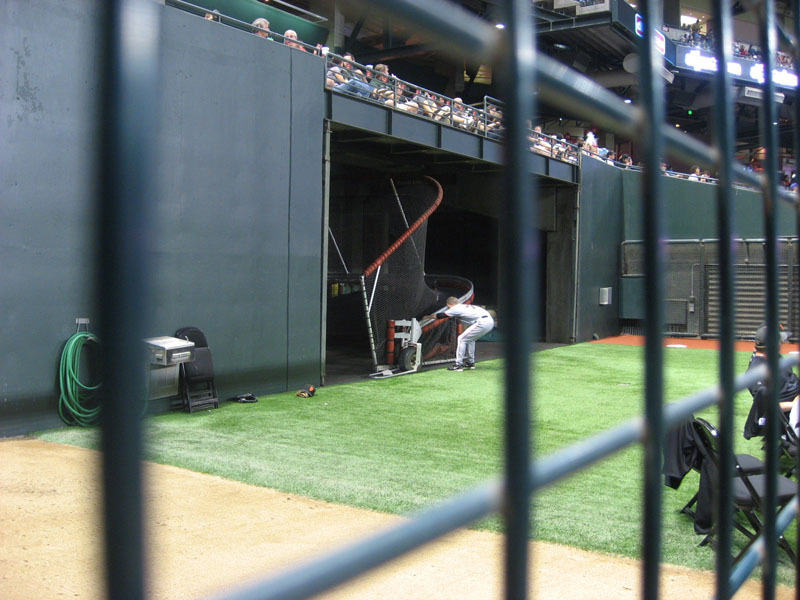 Then A-Rod stepped into the cage, so I moved into the first row because I knew he would try to go opposite way. I was right. He hit a shot RIGHT to me. It caught a little wind at the end, hit the seat, and I picked it right up. Then I got Tyler Clippard o throw me my 3rd ball of the day. My sister was saving me a spot on the wall, so I moved down, and Robinson Cano threw a ball up into the air. I stepped back, and just put my arm up, and felt the ball hit the palm of my glove. Then a minute later Jeff Karstens (I think) threw a ball into the crowd. I took a step back, waiting if anyone dropped the ball. Soon, the ball rolled away, and I snatched it up. I gave the ball away to a kid and his dad (the kid was cousins with the kid I gave the first ball to) and his dad tried to give me $20 for being so nice. My dad wouldn’t let me take it, but the guy gave me 5 bucks, which I later spent on a Sprite. I looked at the clock. It was only 5:30! I was exited and was thinking about double digits. I didn’t get anything the rest of Yankees BP, but my dad did. He caught a rocket in his hat, and I was amazed that it stayed in the hat, because he was up against a seat, and I thought that the ball would go in the hat, and hit the seat and bounce back, or go in his hat, then he’d drop the hat, and the ball would roll away. When the Jays came out, I switched caps, and moved down by the wall. I soon got Jesse Litsch to throw m my 6th ball of the day. Jays BP was practically dead after that. One guy was hitting some into the seats, but it was too hard to move. There was however, one mess-up. A ball was hit into the gap, and the cops let the police dog retrieve it. When the cop went to throw it to me, his throw was high, and hit the top of my glove and bounced away. At about 6:05, there was a ball on the warning track, and I attracted a lot of attention going for it. It was almost at the grass, and I was able to move it in a couple of feet, but then a Blue Jays pitcher, Brad Wolfe I think, picked it up and threw it to me. That was Number 7 on the day. I then moved behind the Jays dugout, and a trainer gave me a ball that rolled over. I didn’t get anything as the Jays came of the field, but I was still very happy. Soon Ray Olmeda came out and made about 5 throws, then went back in, but not before tossing me the ball. Then Matt Stairs started throwing, and he did the same thing as Olmeda. 5 throws and back into the dugout. However, I couldn’t get down because one of those waiters was blocking the aisle. That happened for the first 4 innings. I tried to go down, but I was blocked. In the 5th, Marty Pevey threw me a warm-up ball, for my tenth of the day. Then in the 8th, Pevey gave me another ball! I gave it to a kid in my row. At the end of the eighth, Lyle Overbay threw my sister, who was seven rows back, her first ball. It was a great game, and in the 14th, my mom told me that if the Yanks don’t win by the end of this innings, that we would have to leave. But Brian Bruney gave up the lead and the Jays won. A Blue Jay (probably whoever ended up with the final out ball) tossed it to me. Then Shaun Marcum rolled a ball across the dugout, and with that Jesse Litsch yelled, laughing “Man! He’s got 17!” Not 17 Jesse, but close. My youngest sister also got a ball from Brian Tallet. 13 Balls, Attendance: 54,151, Competition Factor: 703,963. Nice. I was at Chase this spring and it’s the friendliest ballpark I’ve ever been to for a game. So I’m not suprised by the usher’s actions and now I will always remember your 3,200 ball. Congrats. And I LOVE the picture you took of the whole field and stadium. Nice view. You’re a big hockey fan, too? I was lucky to go to a Stanley Cup game when the TB Lightning were vying for the Cup but I’ve never been to a World Series game. :( Maybe I can arrange for a hockey game AND a baseball game when you visit! CUBS: Sorry I can’t answer exactly how old I am, but I’m younger than Zack. alright, I was just wondering if you were like teens, twenty’s or whatever. I had the impression that you were around 15-18, and getting that many balls at that age is truly amazing…. The only day I got more than 1 ball was the day I brought a cards jersey for BP. I guess I’m a Cubs fan first, ball snagger second. hey im goin monday and tuesday to shea. monday front rows tuesday picnic area. you plannin on goin? Thank you! Too bad you missed Chase and had to go to Dodger instead. As for the tippy toes…that’s just par for the course. I know Richie! Nice guy, and yeah, we won’t have any problems in the Loge. As a New Yorker, I have nothing against Giants fans (except the ones who blindly root for Bonds). My motivation for the trip? I just explained it up above to Ethan. You’re not THAT old, but still, I’m glad to hear that my “principles” are working for you. Congrats on reaching the century mark. No one else paid for this trip. It was all me. But I booked the flights a while back and got a good deal. Less than $300 round trip, and the motel was super cheap. Thank you. 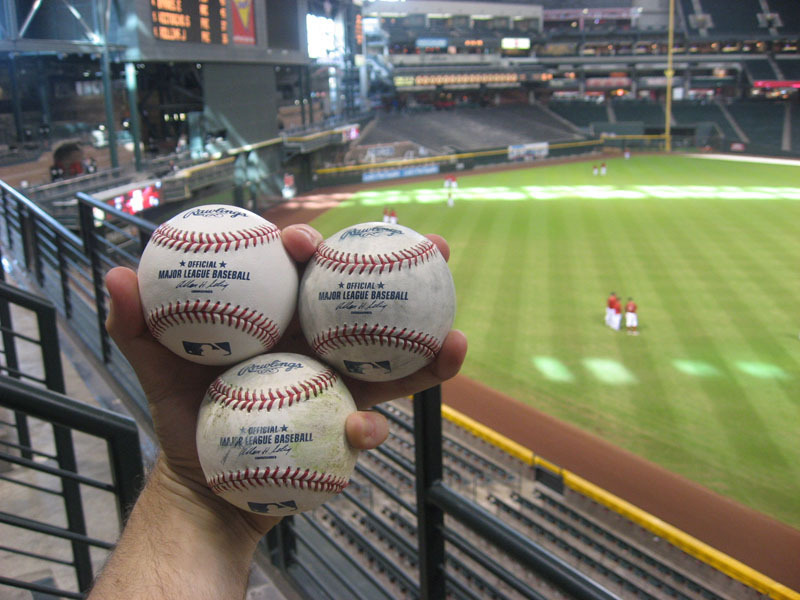 I generally prefer to get milestone balls in stadiums other than Shea and Yankee. My PNC experience is very limited. I was there for one game in 2001 and snagged seven balls, but I don’t remember any specific tricks or strategies. I think I’d do much better there now, and in fact I hope to make it back there within the next year or two. Thanks, and you’re welcome. Glad to help. Don’t worry. I won’t forget about the 29th. You’re the only plan I got that weekend. 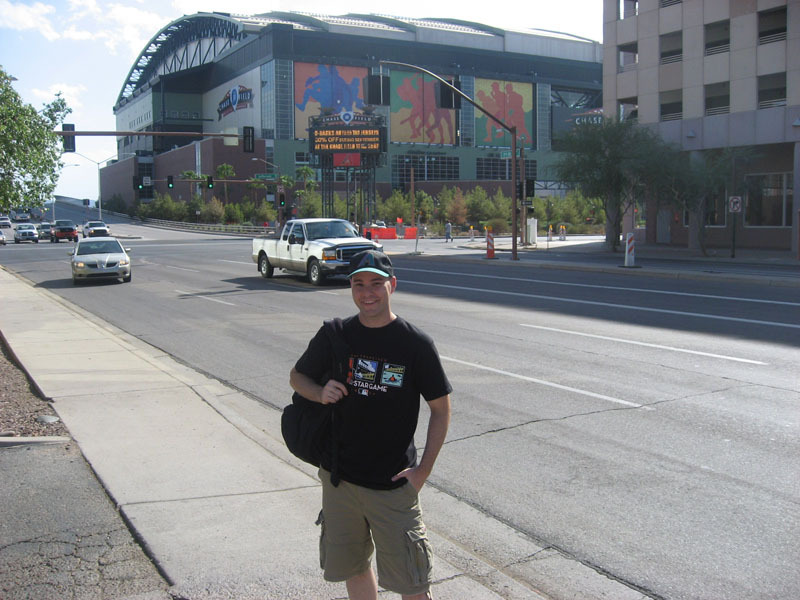 I’ll be at Shea on Monday with “Watch With Zack” clients, so look for me. I might be there Tuesday as well. Or Wednesday. Not sure yet. I’m jealous of your fancy blue seats, but not THAT jealous because I got some good Field Level seats on the right field side. Good spot for foul balls by righties during the game. Nice meeting you too, and thanks. I think the ushers could definitely loosen up a bit. Given the fact of how laid-back everyone else there is, it’s surprising that the rules are so strict. As of this moment, I have no plans to return to Arizona, but that could change at any moment. Thanks so much for the offer, but I have plans that’re gonna keep me on the east cost for the final week of the regular season. thats sooooooo cool that you know Richie! my mom used to have a bright orange bag and he used to make fun of her for it. jokingly of course. there is an usher that guards the foul ball area of the loge for righties and he always tells me to leave. i almost got a roy oswalt foul ball there and when he saw i almost got it, he kicked me out. oh and the other day against the Phillies, i saw the coolest thing. there were a couple of Phillies fans in the first row of the mezzanine cheering on a pitcher as he walked off the field at the end of BP and he threw it all the way up there right to them. i had never seen that before.